ed. note: These are but a few of the many places to go mountainboarding - most kids just love to ride in the dirt anywhere they can find. Have fun. 1. American Skiing Company (ASC) Resorts in New England – Three of ASC’s ski resorts: Sunday River in Maine, Attitash in New Hampshire, and Killington in Vermont, now offer mountainboard rentals during the summer months. Their courses are great for the beginner rider who wants to try the sport to the advanced rider looking for long carves and air. Beginners can take a lesson and get a feel for the board at specially designed parks designated for mountainboarding. Riders can hop a lift to the top and carve down grassy slopes all the way to the bottom. 2. Dragon Dirt in Japan – For the real adventurer, Dragon Dirt is located near Mount Fuji in Japan. This was the first real mountainboard terrain park and has jumps, tables, rails and other high-performance “toys.” This is where Japan’s top riders brush up on their riding skills. 4. Moab, Utah – Utah is known for its beautiful scenery and Moab is no exception. Here, mountainboarders can ride on epic miles of natural sandstone skate park. It’s great to pack your gear in and camp midway through a ride. Here, you’re only limited by your imagination. 5. England’s Eastnor Castle Deer Park – Located on the edge of the Malvern Hills, this is where the British Championships are held each year. This park is a spectacular location to ride long slalom, freestyle, freeride runs and natural Boardercross through streams and gullies. Riders can even camp below by the lakes. This venue offers all levels of riding. 6. The Valley, Colorado Springs (home of MBS Mountainboards) – This spot offers one of the largest dirt parks in America. Mountainboarders often gather here providing opportunities for lone riders to ride with a group. Locals continuously update the jumps so the lines constantly change. 7. High Drive, Colorado Springs – Another one of Colorado Springs’ secrets, High Drive is located in Cheyenne Canyon, at the top of Gold Camp Road. This old fire road has nice switchbacks along three miles of excellent dirt road, and it’s all one-way so riders don’t have to worry about traffic. There are huge dirt and gravel walls for doing tricks and the cliff side has a berm to use as a breakwall that prevents riders from going over the cliff. 8. Book Shelf Cliffs, Grand Junction, Colorado – One of the coolest places ever to ride with miles and miles of rolling dirt hills set up against a 400’ vertical cliff. Bring a shovel and make your own lines. This location is a featured location in a newly released extreme movie, “New World Disorder”. 9. San Francisco’s Hyde Street – This may be a “green circle” for cars, but when you’re on a mountainboard, this could be considered a “double black diamond” trail. Hyde Street is very long and steep. According to a Team MBS member, the best time to ride is after midnight when there is no traffic. As an added bonus, between midnight and 1:00 a.m., the San Francisco Trolley Car is still running so you can get a ride up to the top! Another great location in San Francisco is famous Lombard Street with its switchbacks and steep grade. You in? Buy a board now. Visit our KidzStore for a great selection of boards at some of the lowest prices you’ll find. 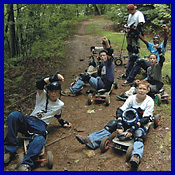 More on the thrill of mountainboarding here.